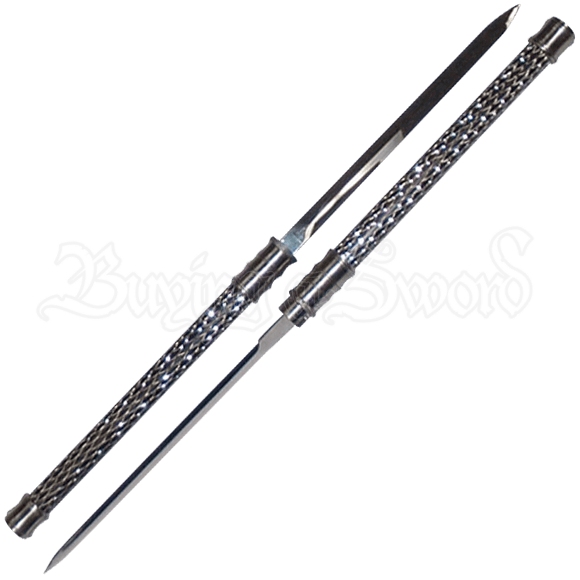 Inspired by traditional martial arts weapons, the Black and Silver Locking Short Swords conjoin to form a short staff. Versatile, stylish, and unique, this decorative weapon set is perfect for taking friends and foes by surprise. Made of stainless steel, these daggers feature traditional double edged spear point blades and slender, easy to maneuver handles. These narrow blades interlock together to form a unique baton weapon, similar to a short staff. A silver pattern decorates the black grip. Twist the rounded guards into place to join them together, and twist them the opposite direction to separate. Ideal for any weapons collector or martial arts enthusiast, this set of decorative daggers makes a fantastic addition to home decor or a thrilling gift for a loved one.